Stormor Systems is a leading provider of mezzanine floors, industrial shelving, pallet racking, longspan shelving, office partitioning, warehouse shelving, storage systems and more. To find out how we can help you, contact us today and tell us about your project. Stormor® Shelving has been designed to keep pace with changes in markets and legislation and the demands that these changes place on our customers and their product ranges. 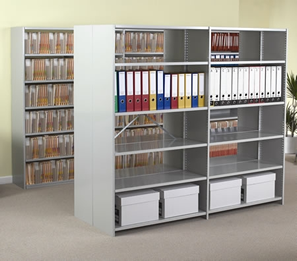 We believe the Stormor® Shelving range meets the changing needs of today’s workplace. Our goal is to achieve an industrial shelving system which makes optimum use of all available space whilst satisfying the huge range of demands posed by the many different products and data records which need accessible storage. The challenge was to incorporate the changing demands into a new shelving system without compromising load capacity and safety. A system sufficiently adaptable to accommodate any product. Comprehensive range of shelf and frame sizes for both general and specific requirements. Easy-fit accessories a comprehensive range of shelf and frame sizes for both general and specific requirements. A minimum number of components with maximum interchange ability. We believe Stormor® Shelving can deliver the right solution for you. Innovation in design is the key to ensuring our customer needs are met. We believe that Stormor® Shelving meets the demands posed by the many different products and data records, which need to be stored while still being accessible. Dedicated interface with our own mechanically assisted or electrically powered mobile systems to truly maximise space utilisation. All accessories fit in all shelves, and all shelves fit in all frames. The comprehensive range of sizes and accessories ensures Stormor makes specifying and building industrial shelving easier and quicker for more versatile solutions. Every project is designed to meet its specific requirements, optimising storage space and minimising waste. All Stormor Shelving and Euro Shelving systems now come with BioCote protection. BioCote is the proven, patent protected coating which inhibits the growth of potentially lethal bacteria and fungi. This reduces the risk of cross-contamination from surfaces with high contact frequency. BioCote provides a valuable contribution to hygiene management in healthcare, food processing as well as other areas where due diligence demands every effort is made to reduce the risk of contamination. To talk about your storage needs and discuss what solution is best for you, get in touch today. Talk to an engineer about your project and we will tell you more about how we can help. How Could Glass Partitioning Benefit my Office Space?